How colourful and amazing are these? The perfect new month, new week planning inspiration. Picture one, two and three are from A Bowl Full of Lemons - a site that is full of useful organising inspiration. Filocuteness is a must follow for weekly updates and planner / Filofax details. Colours 'n Me is a very pretty blog where Malini (a stationery designer) shares her planner updates. The last picture on the bottom right is also from this creative blog. Jennifer from My Purpley Life is full of Filofax inspiration and reviews. Oh, it's all so pretty. I don' decorate my diary, but it has lots of pretty illustrations already. It doesn't have a monthly overview, so I printed some calendars to help with my blog planning today. Such beautiful colourful planners! Mine is just a small lavender polka dot diary which I keep in my handbag. I also have a lovely calendar in my clothing cupboard with inspiring words of wisdom for each month! Thanks for popping in. I just love all the planners. Good idea on printing the extra calendars - so necessary to find a planning system that works for you. Thank you so much for appreciating and mentioning my blog (www.coloursnme.com) here on your blog. That is really kind of you. Oh wow! 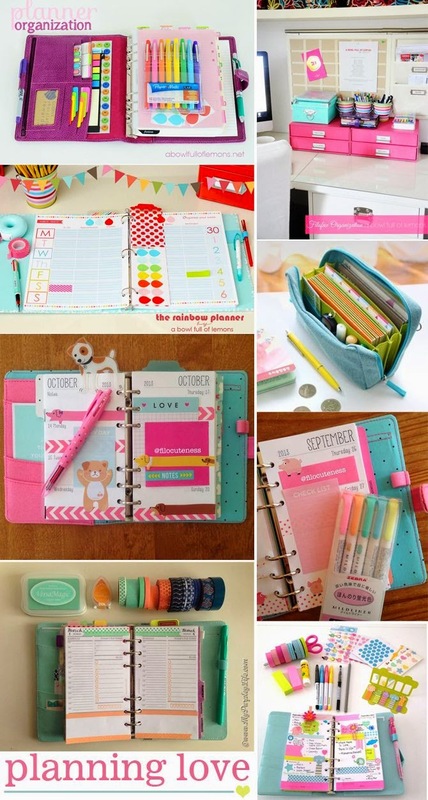 I wish my planner looked like these too - a lot of time and effort but so stunning! I adore your colou combinations. I realy wish I had such stationary colection. Where is the clutch from? I clicked on the link seoulpicks and it's a web hosting site. Thanks!